Clovis Crawfish and all his friends return in a new bayou tale. 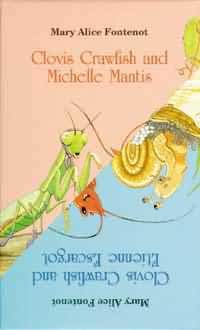 Michelle Mantis, an ugly old insect with an enormous appetite, visits the swamp home of Clovis and his friends. Her voracious appetite alarms Clovis’s friends, for Michelle eats and eats until she can scarcely move. But when Michelle tumbles into the mud, Clovis must rally the other swamp creatures to help. Etienne Escargot makes his way through the bayou country to live with Clovis and the bayou friends. Before reaching Clovis’ home, Etienne releases his eggs, forming a pile of tiny pearly shells. Suddenly the rain begins to fall; Etienne and the eggs are trapped on a mound of mud in the center of swirling black waters. Clovis and his bayou friends enlist the carving talent of Waldeaux Woodpecker and make a pirogue out of a cypress tree limb. Clovis helps Etienne and his eggs into the boat and guides them to safety. Mary Alice Fontenot is best known as the children’s author of books on Cajun culture. She created the famous wetland characters of Clovis Crawfish and his friends more than thirty years ago. 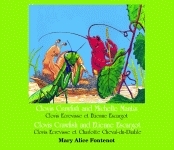 In addition to the Clovis Crawfish Series, Fontenot wrote several other children’s books, including Mardi Gras in the Country and The Star Seed, both published by Pelican. Fontenot worked as a kindergarten teacher and, for thirty-five years, as a newspaperwoman. Her dedication to children and to her art earned her the 1998 Acadiana Arts Council Lifetime Achievement Award. She died in 2003 at the age of ninety-three.